One of Thomas Jefferson's boldest acts as president was the negotiation of the Louisiana Purchase in 1803. He bought more than 800,000 square miles of land from France–sight unseen–for three cents an acre, doubling the size of the United States. The new lands stretched from the Mississippi River Valley to the Rocky Mountains. This initiated the great Westward Expansion of the 1800s. Between 1841 and 1869 alone, as many as half a million emmigrants braved the open prairies and rugged mountain ranges in search of a new start. The progress of a nation depends heavily on technology available at the time. 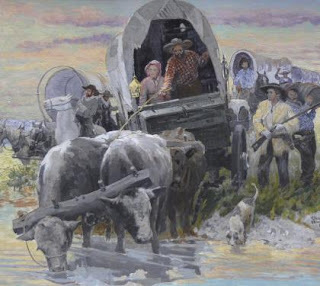 As there were no roads, no steel rails, and little knowledge of navigable rivers, the hardy pioneers moved their possessions and loved ones west in freight and farm wagons, outfitted especially for the rigors of months-long travel. 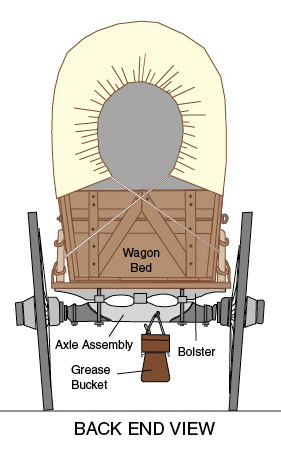 The covered wagon became a Westward Expansion icon, serving as a rolling storage room for food, water, tools, and furniture–as well as living quarters, birthing chambers, storm shelters, and sometimes the only available fortification in case of Indian attacks. There were many kinds of covered wagons in use. 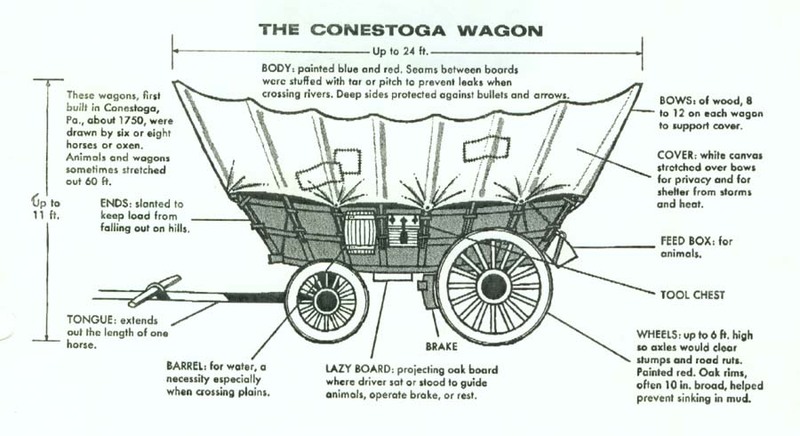 It is a common misconception that all pioneers traveled in Conestoga wagons. That particular vehicle originated in Pennsylvania and was used more for moving heavy freight (up to 12,000 pounds of cargo). In fact, the sheer weight of the Conestoga made it unsuitable for travel across prairies, restricting its use mainly to the eastern states. 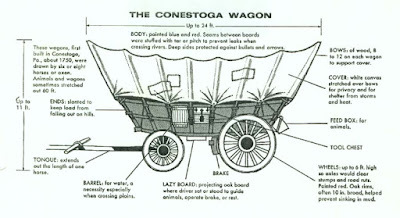 That's not to say that no wagon train included Conestogas–only that they were not the preferred mode of transport. Its design was specialized, with a swooped, overhanging canvas top and a bed that was slanted up fore and aft to keep loads centered. 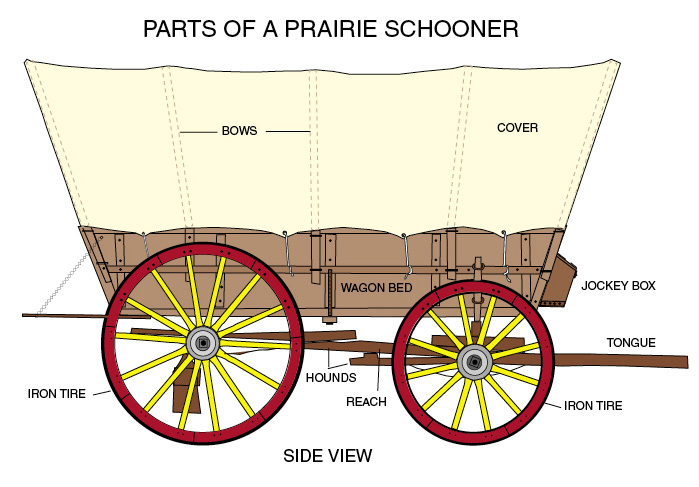 A lighter version of the covered wagon came to be known as the Prairie Schooner, since it resembled a ship with canvas sails crossing the prairie. These vehicles became the minivans of the West, if you will, or perhaps the first tiny homes. They were pulled by mules or oxen, the latter being favored for their strength, endurance, and lesser feed requirements. Most family members walked alongside. The wagon bed was crowded with supplies and usually reserved for small children, pregnant women, and the elder members of the party. Several covered wagon manufacturers sprang up in St. Louis, Missouri, the "Gateway to the West." The most popular was the Joseph Murphy wagon. There were many other makers including Luedinghaus, Linstroth, Gesting, Espenschied, and Studebaker (yes, the automobile manufacturer). 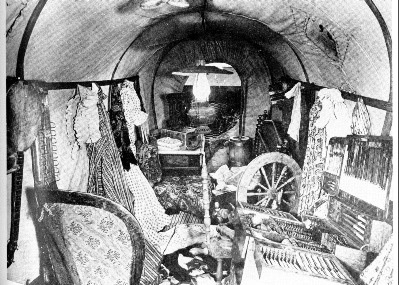 Interior of a covered wagon. Many dear possessions would be left along the trail. 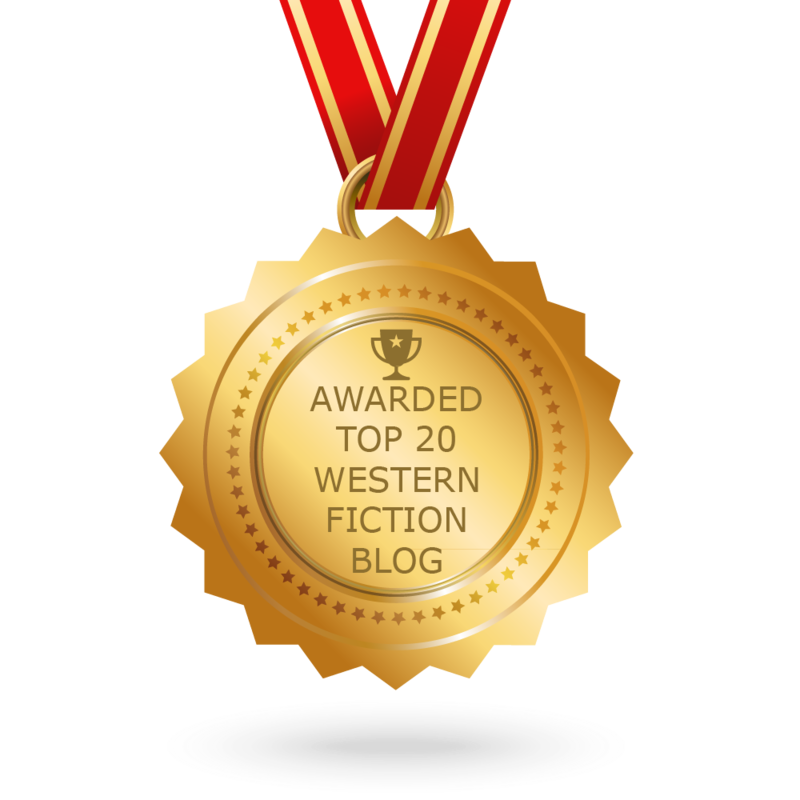 At an average speed of two miles per hour, and covering maybe fifteen miles on a typical day, the journey west often stretched from one season to the next. Even with inherent difficulties (river crossings, broken wheels, etc. ), the covered wagon provided reliable transportation and a humble temporary home to the thousands of pioneer families who settled the American West. “As with the commander of an army, or the leader of any enterprise, so is it with the mistress of a house.” Mrs. Beeton doesn’t beat around the bush with her opinions in her Book of Household Management. This tome, published in 24 monthly parts from 1859 to 1861, and later as a bound edition in 1861, offered advice on everything from running the household to caring for infants. She included many recipes, of course, from soup to fish, but also included chapters on “The Natural History of Fishes” and “General Observations on Quadropeds.” There are even special recipes for the invalid. In this first look at “Mrs. Beeton’s,” as most folk called the book, we’ll focus on the mistress of the house. Your heroine, should she be running a house during this time or even later (Mrs Beeton was still quoted decades after the book was published), would have been well acquainted with this book, and might even have her own copy given as a wedding or house-warming gift. Mrs. Beeton, as I have said, was not a woman to beat around the bush. 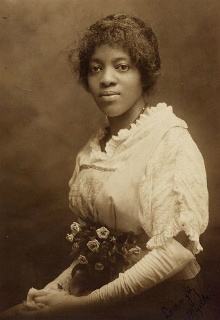 “Early rising is one of the most essential qualities which enter into good Household Management, as it is not only the parent of health, but of innumerable other advantages.” The mistress of the house is cautioned that if she “remain in bed till a late hour,” the domestic help will pick up her bad habits and become sluggardly as well. 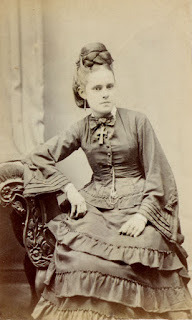 Cleanliness, she advised, was also indispensible to health, and “cold or tepid baths should be employed every morning.” Frugality and economy were considered “home virtues,” however they should never be allowed to degenerate into parsimony and meanness. Mrs. Beeton even goes so far as to touch upon temperament, stating that “Good temper should be cultivated by every mistress” and “Charity and benevolence are duties.” The young mistress of the house is also advised on dress and fashion, purchasing wearing apparel, and general marketing tips. What I especially like is the table showing average yearly wages of domestic help. 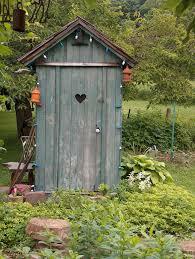 Nothing entertains more than a few good privy stories—even when you’re beyond the age of potty jokes. The one-room schoolhouses produced plenty of them since bathrooms were not connected to the main building. A very few of the schools had brick outhouses, but the majority of the schools’ privies were anything from a copse of bushes to a ramshackle shack to a solidly constructed building—all set away from the schoolhouse. 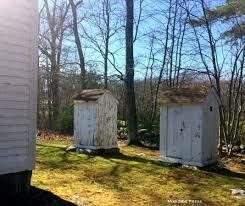 Traditional privies often have the shape of a quarter moon on them. 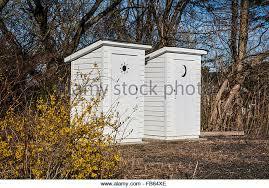 In the old days, two symbols were actually used to identify who should be using the privy. 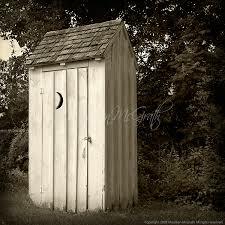 A masculine sunburst was used to identify the [boys] outhouse and a more subdued moon was used for the [girls] comfort station. Symbols were used because hundreds of years ago, a good share of the population was illiterate and in places like the U.S. where many nationalities lived, no matter what language you might read and understand, the moon and sun were universal. As the years passed. . . the moon symbol evolved as the universal symbol of a privy. From “Strolling Down Privy Lane: Digging to the Bottom of Outhouse Lore” by Curt Arens in Living Here Magazine, Winter 2005-2006. However, I was surprised to find that sometimes stars and hearts were sometimes used on the girls--as illustrated. One story was about a four-year old who attended school with his mother, the teacher. Apparently, the little boy wanted to fit in with the older, more “worldly” boys, so he tried to befriend them. Not realizing they were out to create mischief, he went along with them when they asked him if he could do them a favor. His job, they told him, was to help them paint the toilet seats in the privies. 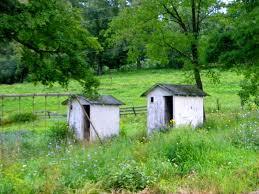 They handed him the paint and the brush, and he proceeded to paint all the seats in both privies. Of course he was caught, but only he got into trouble. Apparently a teacher’s child was on the same plane as a clergyman’s child—always having to remain above the fray. 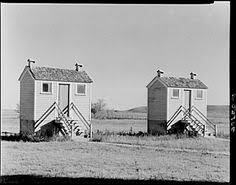 One South Dakota resident remembers hearing about some 7th and 8th Graders putting a cow in the girls privy. When they were discovered, they had to go and figure out how to remove her. Unfortunately, the story ends there. One-Room Country School (Dakotas, August 31, 1999, by Charles L Woodward & Norma C. Wilson. Most of us are familiar with the function of the Sears & Roebuck Catalogues (and later the Montgomery Ward Catalogues), but one school was lucky enough to have had a gift from one of the director’s wives who had been a seamstress and had a big box of old cloth patterns that she donated for toilet tissue. The additional benefits were that the girls would sit outside and open those patterns, learning about darts pleats, and folds. When these girls began sewing, they knew all about making clothes. 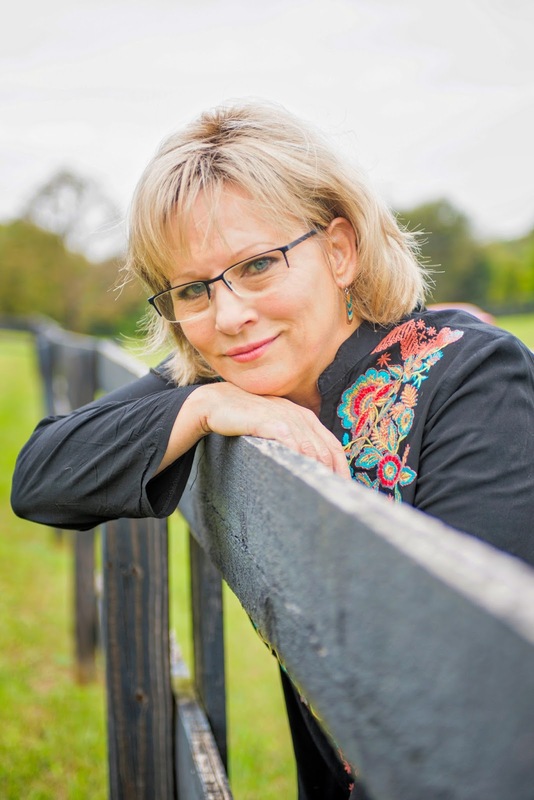 From The One-Room Schoolhouse: A Tribute to a Beloved National Icon by Paul Rocheleau. Norma Wilson (1999) said snakes were always a problem in outhouses. 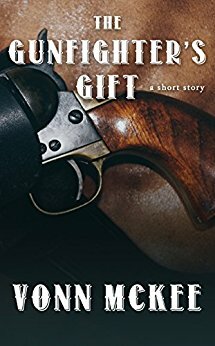 In one of her stories, a teacher sits down in the outhouse and immediately notices a rattlesnake curled up in the corner. 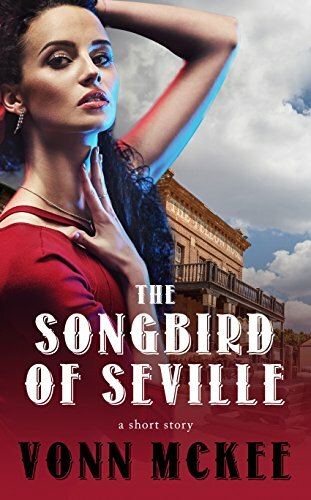 She flew out of the building in a flash to elude the unwanted visitor. 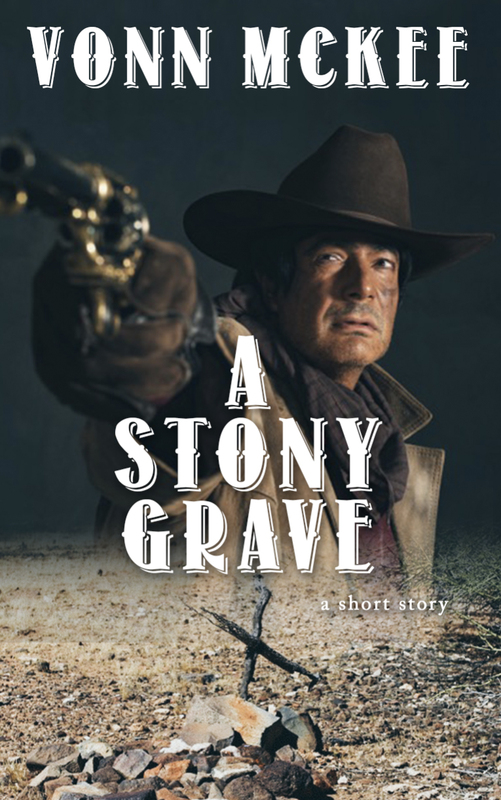 Another story talks about a rattlesnake curled up in the pit of the privy. The teacher and one of her older students were able to prod the snake out of the pit and take care of it with the business end of a shovel. No one mentioned the trauma of black-widowed spiders, but I would imagine that they too presented some excitement in the privies. Hopefully, with all the world/national news being as it is, a few light anecdotes helped alleviate your concerns for at least a little while. Between the humor and the sound of rain falling for the first time in months in California, my spirits are a bit lighter.